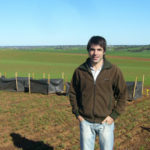 Argentinean couple, agronomists and PhD students Diana Martino and Guillermo Divito met seven years ago and recently found themselves both in Australia training separately – Diana working on frost damage in wheat and Guillermo on nitrogen fixation in crop and pasture legumes. 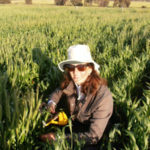 Diana learnt to use the phenotyping method to identify variability in reproductive frost damage in wheat used in the Australian National Frost Project. Diana is also going to test some selected Australian wheat varieties in Argentina in subsequent seasons as a part of her PhD, to compare cultivars with respect to susceptibility to frost damage. “The most important thing that this training provided to me was the opportunity to interact with the broader scientific community of Department of Agriculture and Food, University of Adelaide and CSIRO. It was a great opportunity to discuss my PhD project and allows me to get in contact with them in the future,” said Diana. One of Guillermo’s main activities was doing research for his paper “How do phosphorus, potassium and sulphur affect plant growth and symbiotic nitrogen fixation in crop and pasture legumes? A meta-analysis”, which included improving his skills to search for and process information and complete a critical analysis of the results. The paper was submitted to Field Crops Research in September. Guillermo also attended the “InterDrought-IV” conference in Perth, partially supported by a grant from the UN FAO; visited plots in SA to take plant samples and learn techniques to quantify N2 fixation; participated in Roseworthy chickpea experiments; visited the University of Adelaide’s Plant Accelerator, and attended a “Special Guest Lecture” by Doug Edmeades on Evaluating the Agronomic Effectiveness of Fertilizer Products.